I am a 38F, I have always been large chested. I don't know when buying a bra has been simple for me. It is one of the biggest struggles I have ever had. IT IS ANNOYING!! and hella expensive. Just because I have more doesn't mean I should have to pay more. And...alot of the bras for my bigger breasted crew are ugly. What is up with the old lady looks? Are they the only women with a larger chest? So, for the past year I have been on a quest to find a bra that can give me a boost. Now I know you are thinking, girl you have enough, why do you want a boost? Well, as you get older (I'm 30 next year) your breast change, gravity becomes like that fuckboy you can't get rid of, and they change. My breasts don't sit up how they used to, so they need great assistance. I enjoy wearing low-cut tops and showing cleavage, but it is so hard to find a bra that gives you that lush look. Well, the search is over my peeps. I have discovered Wonderbra and it is true to the name, because I wonder where I have been and I wonder why no one has told me about this bra. Introducing the Wonderbra Ultimate Plunge bra. My twins are sitting up right, they are full and plump and the bra is comfortable as heck!! The inside of the bra has hand prints as if the bra is holding you up with hands. Another bonus is the closing on the back. It doesn't have those stupid clasps things that irritate the life out of me. 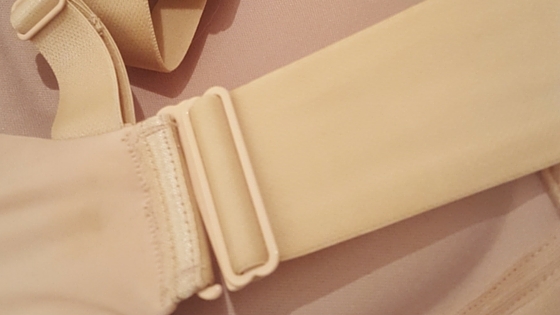 Every bra needs this adjustable strap. I am going to investigate into more of Wonderbra's pieces and see if they are really the MVPs of the game. I need to get myself to Wonderbra!! I have 30E breasts and I find nowhere seems to do nice lifting bras for any size over a D, it drives me mental. Last month however, I found a couple of AMAZING bras in Victoria's Secret that fit amazingly and actually gave my breasts some shape for once!